These flowers are from a few weeks ago, from a celebratory reading that was the last session of a poetry workshop I led in a senior high-rise, where I have been having way too much fun in recent months as a teaching artist. I would love to tell you all about it…about the inspiring human beings who gather for class each week, about the amazing poems they write. About the wit, whimsy, feeling, wisdom, playfulness, intimacy, and kindness that show up each week. Each of the writers in the group wows me each week with the depth of their experience and their openness to the full range of things they are going through now. And from where I sit (and sometimes stand and sometimes wave my hands around in the enthusiasm of sharing a particularly fabulous poem), it seems to me these individuals have become something more than individuals. They are also a community, a band of poets, their support and connection formed through the process of learning about, making and sharing poetry. People sometimes share experiences-joys and sorrows—that are as intimate as anything in a “therapy” group. This makes it hard to show you or give you examples. So I so much want to give you a window into this work…and I want to respect that invisible wall of safety we create around our work each week. Which leaves me with this…I brought these flowers from my garden for our reading celebration. I won’t show you the cake, or the ice cream or the illuminated faces of the elders reading their work. 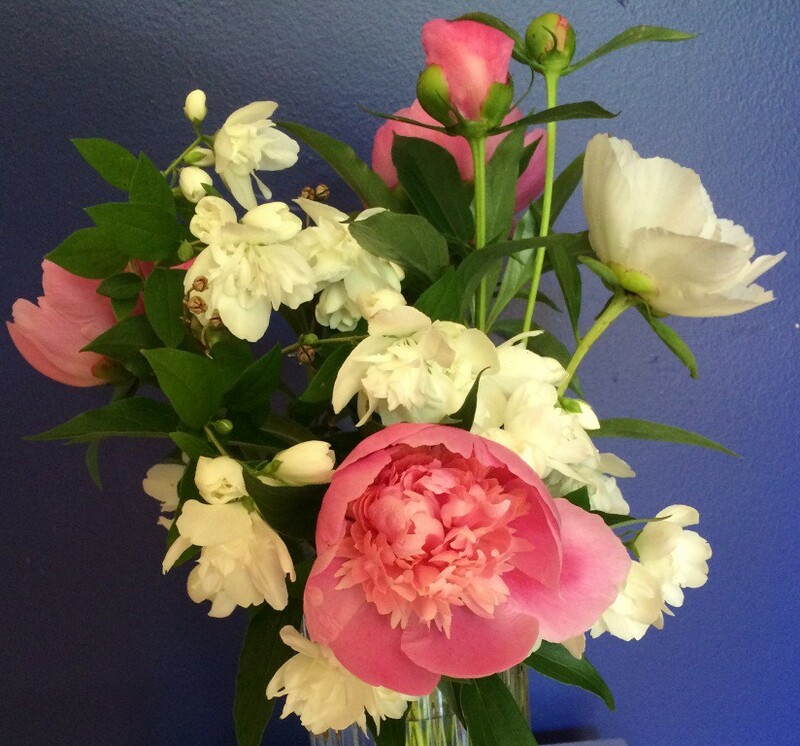 I will just tell you that it was a good year for peonies and poetry and the mock orange smelled amazing and that I learned that people seem compelled to talk with a person carrying a vase of flowers on public transit (maybe that’s another post for another time.) And it was a pretty special party in my book.